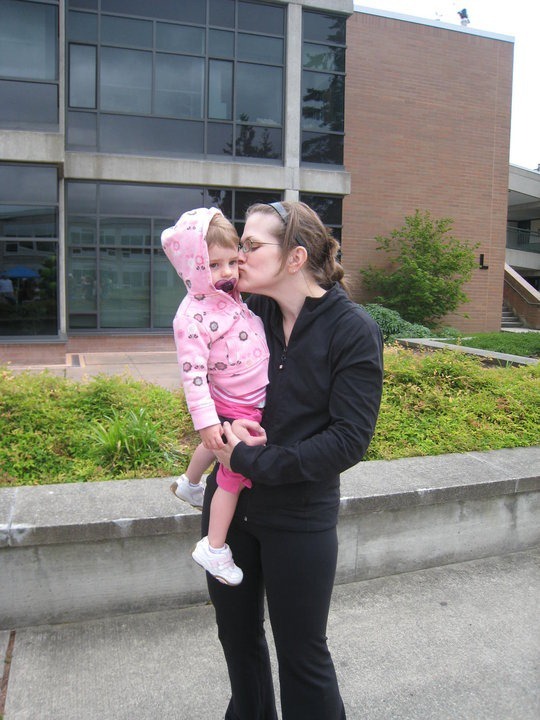 That is a picture of me and my niece, V. We were at the HSDC Fun Run two weeks ago. Do you know what my first thought was when I saw this picture? OMG I look so thin! Seriously, first thought in my head. I stared at that picture for a few minutes longer and it dawns on me. OMG I actually look like that – for reals!! As a refresher – I used to have an eating disorder. I have many tools in my arsenal to combat the thoughts and desires to ever go back there again. It happens. I don’t know if it will ever be erased from my mind. Regardless – I’m so far beyond that at this point in my life. The body image stuff? Yeah…not so much. It’s been a journey. There is so much I could share with you about my battle with my body. The last few years have been interesting. I’ve been working out with the same trainer for almost 3 years now. LOVE her. She has a gentle (militant) way of pushing me beyond my comfort zone to advance to the next step. Shortly after I started working out with her, I told her I wanted Linda Hamilton Terminator arms. (side note – crickets, girlfriend is too young to get the reference) How about Holly Hunter/Saving Grace? (almost there) Once she visited the internets and knew what I was talking about she made it an obtainable goal. I’ve always wanted nice, toned arms. I’ve got ‘em now. And I still want more. How’s that for obsessive? I’ve had a love/hate relationship with denim in my life. It has never fit quite right, too big in the waist, not big enough in the thighs – oh how I’ve hated shopping for jeans! Two years ago Norman convinced me to walk into Nordstrom and have the friendly sales professional help me into a pair of premium denim. That was a different journey all together. That first pair sat in my closet for months waiting for me to wash and get them hemmed. Months. Finally done and really enjoying them, I decided to go get another pair. The second were quite tighter than the first, I referred to them as my Skinny Sausage Jeans. Cause if I was bloated there was no way they were getting on my body. Sure, they always tell you the denim will stretch and form better to your body. The Skinny Sausage Jeans took quite a while for that to happen. Or perhaps – maybe – I had just lost some weight? Last fall I decided to get more jeans at Nordstrom because those first 2 pair were kinda loose. Seems I had gone down a whole size from the first foray. A size! Seems that torturous hell-on-earth my trainer puts me through on a weekly basis has helped the tone of my muscles. Then right after the holidays I was perusing the clearance sales to Martin & Osa (one of my favorite stores for T’s) The clearance rack had jeans that after additional deductions would have been $19. Wow! $19 jeans? I’ve never paid $19 for jeans. Sure, yeah, I’ll try them on. I took a deep breath and grabbed the size I know Nordstrom had fitted me with a few months before. I pulled those on in the dressing room and you know what? They fit like a dream. I nearly started crying. All this body image stuff came flooding over me. For years I have had a perception that I am not one of those girls that can shop off the racks for nice clothes. My body was too fat, strange shape, too short, too tall, too expensive, looks cheap – I’ve done it all. Then they are never the right fit, too loose, too tight, lays weird on my waist – I had every reason in the book. There was a period in my life of long, flow-y dresses and skirts to hide my personal shame. Or the men’s jeans. Or dress slacks that were probably way too big for my body even though I felt good in them. At those times in my life, I would not have been ready for a Stacy and Clinton intervention. Anyway – I bought those jeans. That day, I walked out of the store thinking, OMG all the time I have wasted obsessing about my body. That a number on a pair of jeans and the fit on my body triggered some secret lock and key I wasn’t really aware of. I wanted to write about it back then. But I didn’t. After all, it’s just so much easier to stuff it down and ignore. IGNORE! IGNORE! Isn’t perception the craziest thing? I’m not quite sure where I am going with this next. Honestly started writing about my commit to Turn The Page and March Forward with positive intent. OK – let’s be realistic here, I will commit to starting the process. To begin with acknowledging my true image and what I love about my body. Don’t try to boil the ocean Jen, at least not today.